Disneyland has spawned more urban legends and ghost stories than any other tourist attraction in the United States. 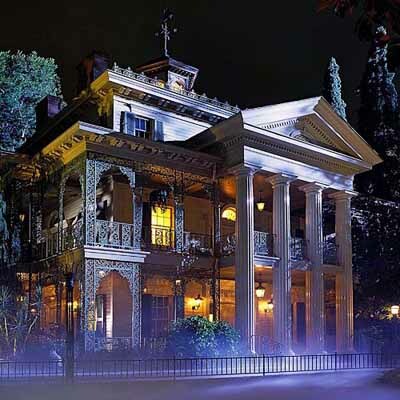 The Haunted Mansion at the Disney theme park is believed to have several resident ghosts, often seen by visitors and staff. The crying boy is the apparition that is most often seen at the Haunted Mansion. His ghost is seen sitting next to the exit of the ride, weeping into his hands. No one knows who the young child is or why he is upset one story is that the deceased boy's mother asked Disneyland employees if she could spread her child's ashes close to the attraction, because he had enjoyed it so much when he was alive. The Disneyland employers said no, undeterred, she took her son's ashes into the ride at night, and spread them there without permission. The ghost of a man with a cane also haunts the Mansion, according to legend, a man was piloting a small plane back in the 1940s over the land where the theme park would be built years later. His airplane crashed into a lake near where the Haunted Mansion was built. Supposedly, his soul has settled into the attraction. He is known as "the man with a cane" by employees at Disneyland. The apparition is most often seen at night when all the parks visitors have left. On one occasion, an employee was working alone at the load area of the mansion, he looked up and there was a man in a suit holding a cane sitting in one of the ride's Doombuggies. The employee tried to speak to the mysterious man but he did not respond. After several seconds he gradually faded away until nothing of him remained. A sound designer was setting up equipment in the Haunted Mansion before the attraction was open to the public. He kept hearing music coming from behind one of the new walls. He believed that a radio had been walled up accidentally, but after several days, the music was still playing, no radio announcer ever came on. The engineer never did find the source of the strange music. One more ghost has been seen at the mansion he is known by staff as the man in a tuxedo. No one knows the apparitions identity. On one occasion an employee was working in the area where passengers disembark from the ride. Here there is a mirror, so the attendant can see when the riders arrive behind her. During her shift she kept seeing a figure in the mirror, when she turned around no one was there. The figure she saw seemed to be wearing a tuxedo, then she felt a chill and a hand on her shoulder, she turned to find no one there. The woman ran out of the Haunted Mansion and quit her job straight away. A ghost nicknamed George is said to haunt the Pirates of the Caribbean ride. George was a workman at Disneyland a beam fell from a ride he was working on and killed him. George's apparition is often seen in the early hours of the morning, and is often mistaken for an intruder. A young blond girl has been spotted at the Spaceship Earth area at the Epcot Center. Her ghost is often seen sat in one of the cars that take visitors around the centre, sometimes she is with a young boy. There have been sightings of ghosts at Space Mountain and the Big Thunder Railroad attractions in the past six months by employees at Disneyland. And most recently a video from security cameras at Disneyland seems to show what is believed to be the ghost of Walt Disney walking through the grounds. The apparition is caught by multiple cameras, and it seems to walk right through closed gates and even across water.